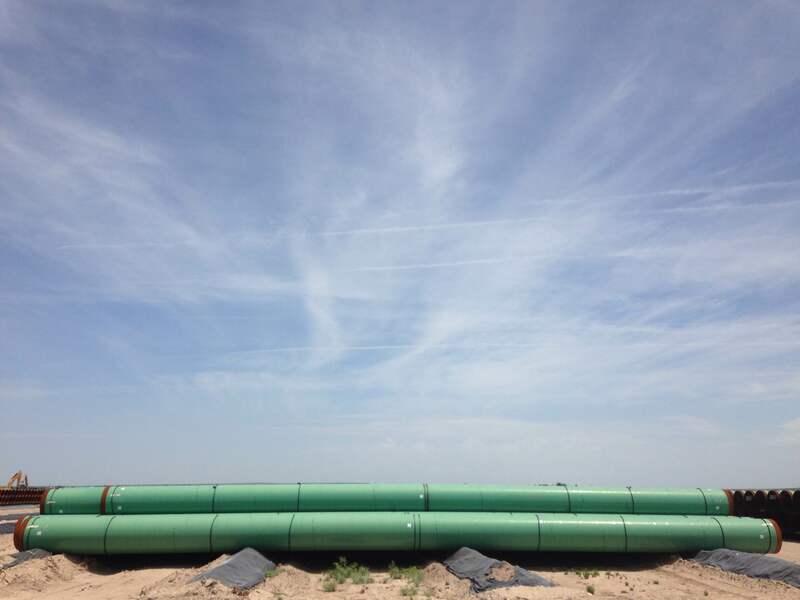 Dallas-based Energy Transfer is moving along with its plan to build a 143-mile natural gas pipeline from the Permian Basin to Mexico, despite growing opposition to the plan in the Big Bend area. There have even been calls from West Texas counties for expanded federal oversight of the project, which would carry natural gas from Texas producers to Mexican power plants. On Wednesday in Alpine, company representatives revealed new details and gave a status update on the project. The day before, the company hosted a similar meeting in the border city of Presidio. “We’ve moving along very well, in terms of advancing the pipeline,” said Rick Smith, Energy Transfer’s V.P. of Engineering for the Trans-Pecos Pipeline. Smith said the company has completed land surveys on 111 miles of the pipeline’s proposed 143-mile length, and has received permission from landowners to survey a total of 126 miles. Still, the company hasn’t reached any formal deals with landowners yet. The details revealed at Wednesday’s meeting – and the fact that the meeting was held in the first place – showed Energy Transfer is aware of the criticism that’s been lodged at its plan, and at the company itself. 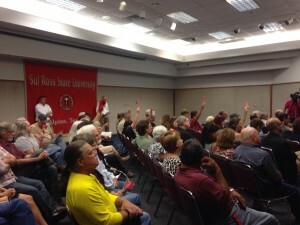 Area residents, led by the Big Bend Conservation Alliance (BBCA), have raised a number of concerns about the plan – ranging from safety and the risks of a potential explosion or fire on the line – to its potential effect on the overall quality of life in one of the only parts of Texas not yet touched by the oil and gas industry. “I don’t feel any differently than I did when it started,” said Coyne Gibson, an opponent with the BBCA. He said the group will continue its efforts against the plan. Energy Transfer appears willing to cater to some of the citizen concerns, at least in part. Company representatives answered detailed questions on Wednesday, and heard passionate statements from residents – most against the pipeline, some for it. The company says it’s planning additional safety measures on parts of the line around the Alpine area – burying the pipe a few feet deeper, adding more control valves and using a higher-grade pipe material near the town. The company also announced it’s considering alternate routes that would take the pipeline slightly farther away from the Alpine area, though Smith said the currently proposed route – which would run near residential parts of the city – is still the “preferred” route. Another point of contention for opponents: the possibility of “compressor stations” being built along the pipeline. Critics say those above-ground, gas-moving units would be loud, ugly, and potentially dangerous. The company has said repeatedly that “initial plans” only call for one compressor at the pipeline’s starting point near Coyanosa, Texas. Smith elaborated Wednesday to say if, down the road, additional compressors are needed, they likely would not be built near Alpine, but somewhere between Marfa and the U.S.-Mexican border. The representatives that spoke Wednesday would not answer questions from reporters, but Energy Transfer Spokesperson Vicki Granado said the meetings are an effort to respond to criticism from elected officials that the company has a transparency problem. U.S. Congressman Will Hurd (R-23), previously criticized Energy Transfer for providing “cursory responses” to a list of questions Hurd gave the company. FERC is the government agency that will approve or deny a permit the pipeline needs to cross the border. Alpine Mayor Avinash Rangra has voiced similar concerns. He’s been outspoken against the plan, and said he didn’t hear anything Wednesday to change his mind. He did say the meeting was a step in the right direction. Still, Rangra said there was “some sugar-coating” from the company. The Big Bend Conservation Alliance is now focusing its opposition efforts on the federal review of pipeline’s border permit application. Some see Energy Transfer’s public outreach as more of a renewed PR campaign than an earnest effort to address opponents’ concerns. Smith’s comment that the company wouldn’t answer questions about a recent explosion on one of its pipelines in Cuero, Texas drew laughs from the audience. During his presentation, some waved red bandanas on sticks to “raise a red flag” about statements they felt were untrue. Still, there are local supporters of the plan, and they’re becoming more outspoken. The night’s first public comments came from a supporter – an area rancher named Mo Morrow who said his family roots in the region stretch back to the 1890’s. “This is my neighborhood and this is my backyard too,” he said, adding that local counties would be foolish to pass up the estimated millions in tax revenue that pipeline would generate. Morrow said on a personal level, he’s hopeful the pipeline could help slow the sub-dividing and selling off of area ranches that’s happened in recent decades. “If this project goes through one ranch, one family’s ranch, and it enables them to generate enough money to stay together one more generation, I’m for it 150 percent,” he said. 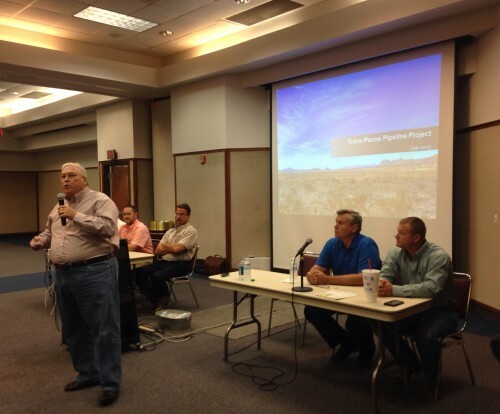 As the debate continues, segments of the pipeline are steadily arriving into the Fort Stockton area. Meanwhile, the judge and a commissioner in El Paso County are echoing the Big Bend counties’ requests for more federal oversight on the Trans-Pecos Pipeline, and on a separate Energy Transfer project called the Comanche Trail Pipeline. This entry was posted in KRTS News and tagged alpine, Big Bend Conservation Alliance, Brewster County, Energy, Energy Transfer, Industry, Infrastructure, Mexican Energy Reform, Natural Gas, Oil and Gas, Presidio County, Trans Pecos Pipeline. Bookmark the permalink.